All of our candles are created with hand written notes of inspiration. The notes are in pods and will be discovered as the candle burns. Each candle can burn up to 40 hours. We have a variety of colors, scents, as well as ribbons to decorate the candles. We use high grade paraffin wax and phthalate-free fragrances. Custom candles are available upon request. We sell our candles on Etsy and at a few boutique shops. The funds from these candles help us carrying on out mission of empowering those impacted by cancer. 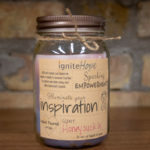 To support us please purchase one of our IgniteHope Candles from Etsy, or donate to us directly.